There was an interesting bit of news out of NASA recently to which, I confess, I did not pay close enough attention. On December 5th, the Agency announced the startling discovery of "Kepler-22b," the first extra-solar superearth-type planet orbiting in the habitable zone around a sun-like star. What does this mean to you? Aliens. Aliens who look just like us. Aliens who look just like us and are perhaps bent on galactic conquest. It is a well-known fact in science-fiction that when aliens who live on an earth-like planet deplete, pollute, outgrow or ransack their own world, they head straight out into space looking for an earth-like-like planet to colonize. If there are only two such planets in all the universe and ours is the one that hasn't been destroyed, that puts us on the short list. But, what, you may ask, is a "superearth?" It's a planet that is earth-like, but has much greater mass than our own earth. In the case of Kepler-22b, as much as 35 times the mass of our planet. 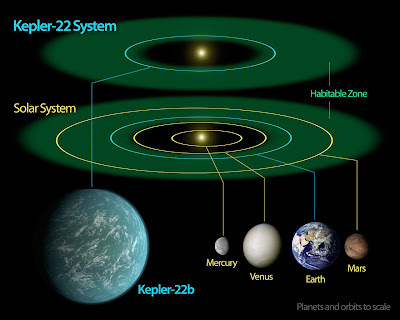 As you can see in this handy chart, Kepler-22b is indeed a plus-size planet, and so its inhabitants will most likely be up to 35 times larger than us. I don't have any sound science to back this up, but it's a funny idea. Kepler 22b. It's awfully big. What's that you say? Wouldn't Kepler-22b's gravity be 35 times greater than our own, and wouldn't that make its inhabitants 35 times smaller than us? Well, okay, maybe you're right and I'm wrong, but it's my blog. Anyway, should we be worried? In a word, no. First of all, we have no way of knowing if the Keplerites or Kepleronionas or 22beings are aware of the existence of our planet. Second, even if they are, we have no way of knowing whether they are capable of interstellar travel. They are, after all, about 600 light years away from us. It seems to me that the prudent approach to this news is to begin our own colonization of Kepler-22b. It's got lots of room, but I think that that would be counteracted in time, as future generations of earth colonists would undoubtedly grown to 35 times our current size. Again, no actual science here, but as I said, it's my blog. But you know exactly what would happen: our fleet of space arks would meet up with their fleet of space arks halfway between earth and Kepler-22b, and we'd all look pretty silly then. It's Just a Drone, People!